They had spread throughout all the provinces in Central Italy and, following World War II, they had also crossed the ocean into South America, Australia, Canada, and the United States. 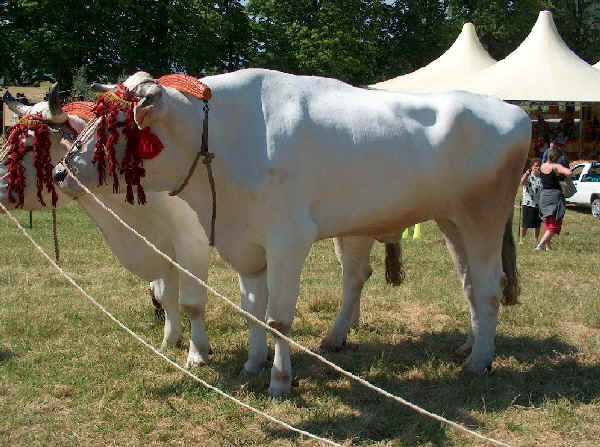 The giant of the species, pure white and highly noble in its morphological perfection, Chianina has earned an international reputation thanks to a genetic heritage that is unique throughout the world. Its characteristics of somatic gigantism, rapid growth and early maturity are combined with enormous resistance to harsh environmental conditions and great ease of calving, all of which represent zootechnical factors essential to the production of beef that is commercially superior since it is lean and offers excellent nutritional characteristics. Put together, these characteristics have made Chianina one of the best beef cattle breeds in the world. The National Association of Italian Beef-Cattle Breeders (ANABIC - www.anabic.it) was established to promote and implement all types of initiatives aimed towards improving, developing, ad spreading the autochthonous Italian cattle breeds: Marchigiana, Chianina, Romagnola, Maremmana and Podolica. ANABIC, which came about by merging the previously existing individual National Breed Associations, has taken on their responsibilities as far as selection is concerned and has set up a single National Herd Book for the Italian beef-cattle breeds. There are 805 ranches enrolled in the Herd Book, for a total of 31.000 controlled head of cattle.